Charlotte Graham was kidnapped and held for four years before the police found and rescued her. Now she has a new identity and an unanticipated fortune after the death of her grandfather. When she decides to sell off a rare coin collection, she meets Bryce Bishop. Bryce is intrigued by Charlotte and her story, but she has decided to stay alone and keep quiet about her past in order to protect her family. When a reporter starts writing a book about the kidnapping, Charlotte will have to decide who she can trust and whether keeping silent will save her loved ones or put them into the path of danger all over again. I've mentioned my adoration of Dee Henderson's O'Malley series, so I regret that this book didn't work for me on several levels. The first problem is that the story is bogged down in wealth, both in broad and specific ways. The two protagonists meet because Charlotte is looking to sell a massive collection of coins that her grandfather accumulated during his lifetime. Bryce is in the rare coins business (at least for the moment) and he takes on the job of evaluating and selling this treasure trove. If you want to read a novel that will simultaneously teach you about rare coins, this would be the one to choose. Otherwise, talking about the value of rare coins takes up a lot of space in this story. There is also some cognitive dissonance in this book, simply because Charlotte has come into so much money from her grandfather. Reading page after page about Charlotte and Bryce deciding to give away millions and millions of dollars is difficult to relate to, especially with the current economy looking the way that it does. As the story progresses, Charlotte and Bryce have to make a major decision about their relationship. Without giving away too much of the plot, I will just say that the decision that they make never felt authentic to me. Instead of the ridiculous "love at first sight" plot that seems to mar many stories, Henderson's relationships seem to take too long to go anywhere. I certainly believe in relationships that put others first and being patient and gentle with the people that you love, but Bryce's actions take this concept to new, perhaps unbelievable, levels. It was even more difficult because despite almost 500 pages with him, I never really felt like I knew Bryce. We just don't get much of his backstory among all of this coin talk. Unspoken is a low tension story. While Charlotte's kidnapping is a constant shadow over her life, she is not in current danger from the kidnappers. This book shows readers the slow evolution of a friendship as Bryce and Charlotte get to know each other and decide how far to take their relationship. 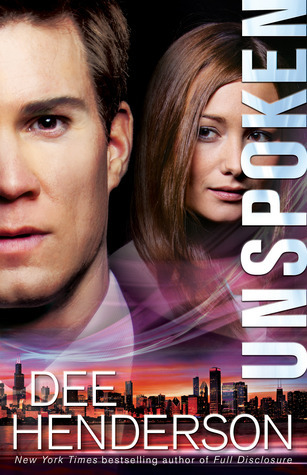 Dee Henderson will always be one of my favorite authors, but the characters in Unspoken are not among my favorites. I think it's tough when you absolutely love a book or series by an author and then the next one doesn't live up to your expectations. You just keep hoping! I think I read a Dee Henderson years ago. At first I thought it would be interesting because you mentioned her having been kidnapped, but emphasis on wealth and less on her trauma might not work for me either. Thanks for being honest. I think the title is rather indicative of the plot - we just don't get a lot of information about the kidnapping because Charlotte thinks keeping quiet will keep her and her loved ones safe. So she hasn't ever talked about what happened and she doesn't reveal much in this book either.